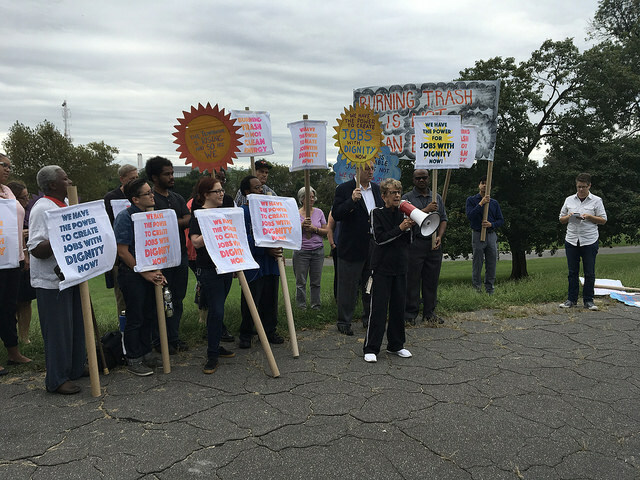 On September 21st, a group of Baltimore residents, local elected officials, and environmental advocates rallied in a strong showing of support for clean air and a just transition to zero waste in Baltimore before a hearing at the Maryland Department of the Environment (MDE). After the rally, MDE held a hearing on a proposed regulation to reduce the amount of nitrogen oxides (NOx) pollution that the Baltimore Refuse Energy Systems Co. (BRESCO) trash incinerator in South Baltimore is allowed to emit by 200 tons per year (almost a 20 percent reduction). This is a relatively strong NOx limit when compared to those set by other states for older incinerators like BRESCO in areas like Baltimore that exceed federal air quality standards for smog (ground level ozone). What Maryland is proposing is a step forward – but not nearly enough, considering the already very high levels of asthma and air pollution in Baltimore and the environmental injustice created by incineration. "While residents are doing everything we can to improve the quality of the air we breathe, the BRESCO trash burning incinerator continues to burn jobs, money and precious natural resources.” Destiny Watford of Curtis Bay said. “Baltimore can do better than BRESCO and it's time we move forward with a Zero Waste vision that puts our health, economy, and environment first." As a part of the proposed regulation, MDE has also charted a path toward setting even stricter emissions limits in 2020. Councilman Edward Reisinger of Baltimore’s 10th district, home of the incinerator, said, “BRESCO needs to update their facility or close!” Advocates told MDE that it must go much farther to protect public health during this process, particularly given the amount of money the facility receives from the state. According to the Baltimore Sun, Wheelabrator has been awarded approximately $10 million over the past six years for being a so-called "renewable" source of energy in Maryland. However, the pollution limits in MDE’s rule require the company to spend a mere fraction of this - $225,000 to $250,000 a year - to clean up the NOx emitted from the incinerator’s smokestack. And ultimately, even with the possibility of stronger pollution limits in the future, burning trash will remain an inherently polluting and unsustainable method of reducing waste volume and producing energy. "For too long incinerators have been pumping carbon pollution into our atmosphere and pollution into the lungs of the most vulnerable," said Heather Moyer, board member of Interfaith Power & Light, DC MD & NoVA. "Thousands of faithful Marylanders in hundreds of congregations across the state are committed to clean energy and clean air. A healthy Maryland for all of God’s people and all creation is possible." In 2015, the BRESCO incinerator emitted roughly double the amount of greenhouse gases per unit of energy produced by each of the 6 largest coal plants in Maryland. Wheelabrator currently receives unearned subsidies for this energy.